This is a audiobook you will cherish for a lifetime, for within it are the secrets to making all your dreams come true. 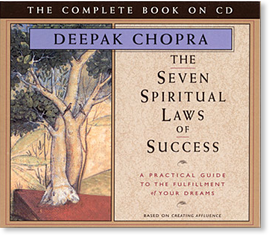 Deepak Chopra distills the essence of his teachings into seven simple yet powerful principles that can easily be applied to create success in all areas of your life. Based on natural laws which govern all of creation, this book shatters the myth that success is the result of hard work, exacting plans, or driving ambition. Instead Chopra offers a life-altering perspective on the attainment of success: Once we understand our true nature and learn to live in harmony with natural law, a sense of well-being, good health, fulfilling relationships, energy and enthusiasm for life, and material abundance will spring forth easily and effortlessly. Filled with timeless wisdom and practical steps you can apply right away, this is a audiobook you will want to listen and refer to again and again. Success in life could be defined as the continued expansion of happiness and the progressive realization of worthy goals. Success is the ability to fulfill your desires with effortless ease. And yet success, including the creation of wealth, has always been considered to be a process that requires hard work, and it is often considered to be at the expense of others. We need a more spiritual approach to success and to affluence, which is the abundant flow of all good things to you. With the knowledge and practice of spiritual law, we put ourselves in harmony with nature and create with carefreeness, joy, and love. There are many aspects to success; material wealth is only one component. Moreover, success is a journey, not a destination. Material abundance, in all its expressions, happens to be one of those things that makes the journey more enjoyable. But success also includes good health, energy and enthusiasm for life, fulfilling relationships, creative freedom, emotional and psychological stability, a sense of well-being, and peace of mind. Even with the experience of all these things, we will remain unfulfilled unless we nurture the divinity inside us. In reality, we are divinity in disguise, and the gods and goddesses in embryo contained within us seek to be fully materialized. True success is therefore the experience of the miraculous. It is the unfolding of the divinity within us. It is the perception of divinity wherever we go, in whatever we perceive in the eyes of a child, in the beauty of a flower, in the flight of a bird. When we begin to experience our life as the miraculous expression of divinity, not occasionally, but all the time then we will know the true meaning of success. . . .
All of creation, everything that exists in the physical world, is the result of the unmanifest transforming itself into the manifest. Everything that we behold comes from the unknown. Our physical body, the physical universe, anything and everything that we can perceive through our senses is the transformation of the unmanifest, unknown, and invisible into the manifest, known, and visible. The physical universe is nothing other than the Self curving back within Itself to experience Itself as spirit, mind, and physical matter. In other words, all processes of creation are processes through which the Self or divinity expresses Itself. Consciousness in motion expresses itself as the objects of the universe in the eternal dance of life. The first spiritual law of success is the Law of Pure Potentiality. This law is based on the fact that we are, in our essential state, pure consciousness. Pure consciousness is pure potentiality; it is the field of all possibilities and infinite creativity. Pure consciousness is our spiritual essence. Being infinite and unbounded, it is also pure joy. Other attributes of consciousness are pure knowledge, infinite silence, perfect balance, invincibility, simplicity, and bliss. This is our essential nature. Our essential nature is one of pure potentiality. When you discover your essential nature and know who you really are, in that knowing itself is the ability to fulfill any dream you have, because you are the eternal possibility, the immeasurable potential of all that was, is, and will be. The Law of Pure Potentiality could also be called the Law of Unity, because underlying the infinite diversity of life is the unity of one all-pervasive spirit. There is no separation between you and this field of energy. The field of pure potentiality is your own Self. And the more you experience your true nature, the closer you are to the field of pure potentiality. The experience of the Self, or “self-referral,” means that our internal reference point is our own spirit, and not the objects of our experience. The opposite of self-referral is object-referral. In object-referral we are always influenced by objects outside the Self, which include situations, circumstances, people, and things. In object-referral we are constantly seeking the approval of others. Our thinking and our behavior are always in anticipation of a response. It is therefore fear-based. In object-referral we also feel an intense need to control things. We feel an intense need for external power. The need for approval, the need to control things, and the need for external power are needs that are based on fear. This kind of power is not the power of pure potentiality, or the power of the Self, or real power. When we experience the power of the Self, there is an absence of fear, there is no compulsion to control, and no struggle for approval or external power.